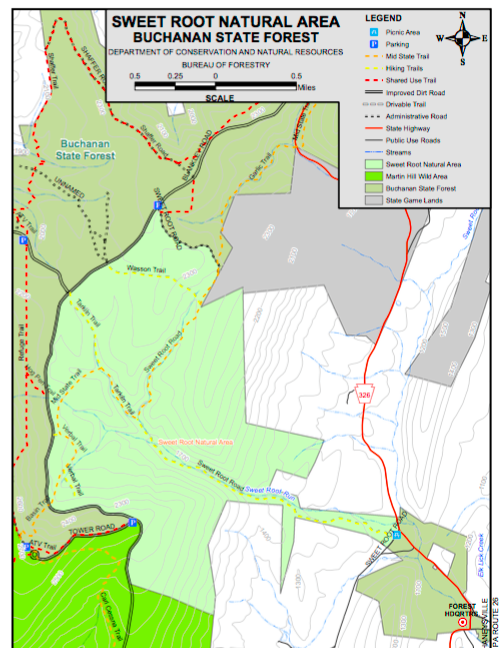 Today we do a little exploration on the Garlic Trail, a spur trail of the Mid State Trail in Buchanan State Forest's Sweet Root Natural Area. This area once had an old growth forest area, though most of the old growth has succumbed to disease and weather damage. The area is still gorgeous and remote. While I did go on a day in which sleet and freezing rain were ruling, the temperatures were not too bad. It was surprising not to see many hikers or anyone in the area. I did not see a single soul for the entire time I was hiking. There is something so inspiring about these kinds of hikes. The seclusion and quiet reinvigorates me to the core. I parked at the Garlic Trail Trailhead. There is only room for a few cars in this spot. There is a much larger parking lot available at the Sweet Root Natural Area picnic area and this trail is accessible through the trail network over there. This photo gives you the gist of what this serene hike is about. It follows along a small mountain creek heading down a gorge in the heart of the rugged Allegheny Mountains. There is some nice elevation change up this gorge, and you zig-zag along the little creek, crossing on stepping stones and slowly weaving your way up the mountain. I personally rate this trail as the easier end of moderate. There is constant elevation change without breaks. The wet stepping stones that would normally be slick in regular conditions, were really slippery in their frozen state. This just made things more fun for me, but they were the only hazard I really had to deal with. Here you can see the scope of this gorge, a small break in the mountain that allows you to head up the Allegheny Front. The entire way is filled with these rhododendrons. You can always tell what the weather is like by looking at their leaves. You can see that it was a little cold, but not terribly cold, for the leaves were not tucked in too far. The sweeps of lichen and moss covered rocks and boulders are absolutely beautiful. The surroundings of this trail are gorgeous. Looking up what we are about to ascend. The funky weather brought about a stunning fog. This fog would block out the vista at the top of the mountain, but the beauty of hike more than made up for that. Here you can see a tree that fell into the area of the trail and was cut to clear the way. The rings tell us that this was a pretty old tree. The hike heads through groves of rhododendrons and stately hemlocks. There was cooler weather and freezing rain approaching during the hike. You can see that it was a little colder in how the leaves are pulled in. This is the kind of view that most dominates throughout the hike. The climb gets steeper as you go. Since the steepness change is not abrupt, you do not end up really noticing it. A seemingly endless grove of Rhododendrons. Getting close to the top! At the junction of the Garlic Trail and the Mid State Trail. It is roughly 1.2 miles each way on the Garlic Trail. From here you could hike to Maryland or New York if you had the time and supplies to do so. Registration point for the Mid State Trail. Log shows that it seems there have only been visitors every few days. Granted many people do not write in the log, but in the summer there were at least a few visitors daily. This is a nice, secluded and quiet place with an excellent moderate level hike. With about 600 feet elevation change in just over a mile, this is a fun hike. At this point in the mountain we are practically in the clouds. I mean, this place was a real hive of activity. The Sweet Root Natural Area picnic grounds are just down the road. This area was home to an old growth forest, though most of the trees have succumbed to disease and weather damage. There are still some seriously impressive trees in this area, so I do not suggest omitting a visit to this place.